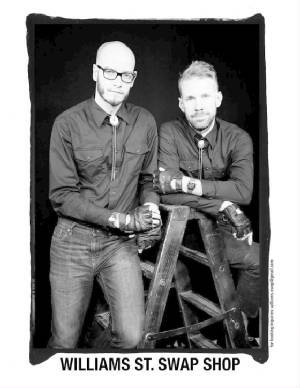 Williams Street Swap Shop, also known as WSSS, is a daily web stream and televised program hosted by Matt Hutchinson and Zach White, two of the greatest American humorists of our time. 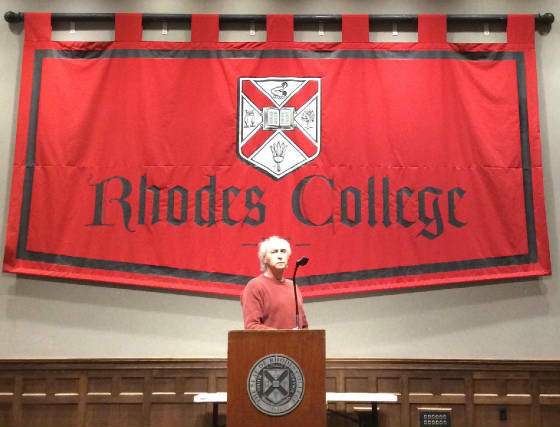 Emmy Award winners, they uphold the revered traditions of Mark Twain, Will Rogers and Bennett Cerf. They understand very well that laughter is the greatest medicine, and that the quickest way to repair a broken spirit is through tickled ribs. In that regard, Matt and Zach are great physicians. They have many patients who depend upon their prescription for joy, mirth and merriment. Their viewers lives are enriched by them. Inspired by them. Their fans enjoy well-being and contentment because of them. The thought of Matt and Zach will always bring bountiful smiles to those who have known them. 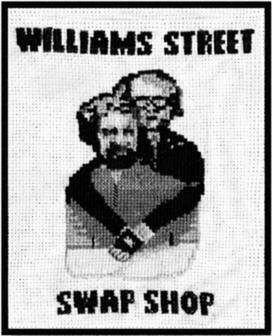 Williams Street Swap Shop is an enduring legacy. With the greatest respect, admiration and love. 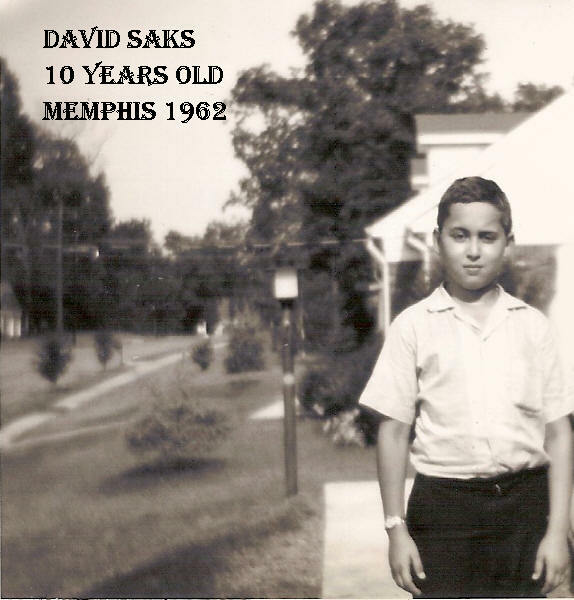 It's close to midnight in Memphis. In a few minutes I'll be 65 years old. Funny, I don't feel that old. More like 35 or younger. Tomorrow is B-Day for me ! Thank you to all who are in my life, and to those who have come and gone. 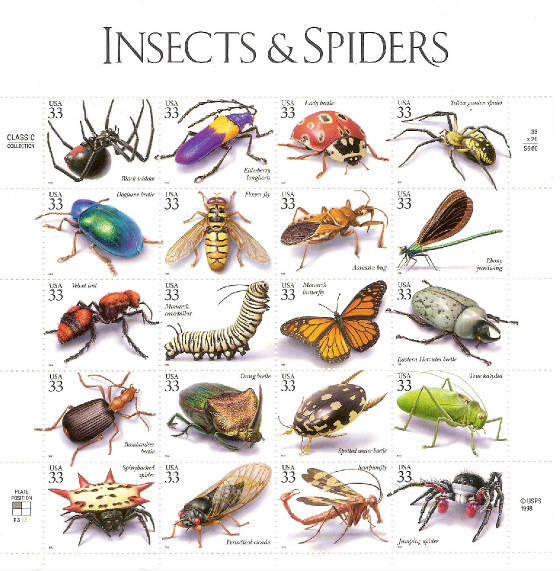 On October 1, 1999 the United States Postal Service issued the "Insects and Spiders" sheet, Scott Catalog #3351, as part of the "Classic Collection" of United States stamps. 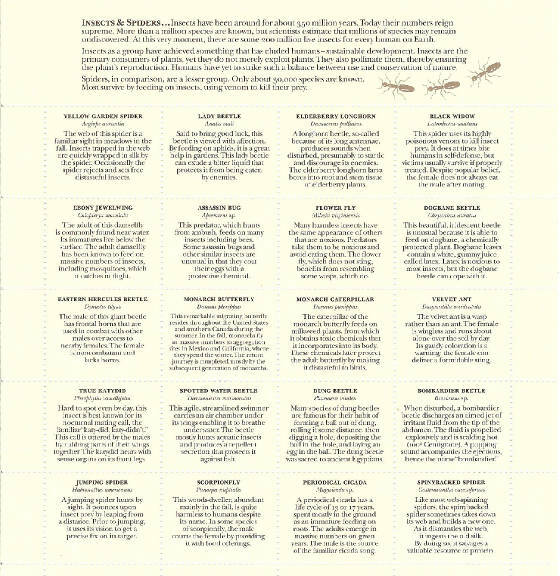 Find this beautiful sheet and present it as a gift to any young, aspiring, ambitious entomologist. The $6.60 investment in 1999 is worth $15 to $18 dollars today. The David Saks Show Tonight ! Check out my radio show tonight ! Norma Jeane Mortenson was a sweet child. She was born in Los Angeles. In August of 1946 a man from Hollywood by the name of Ben Lyon, an executive with 20th Century Fox, called her Marilyn. 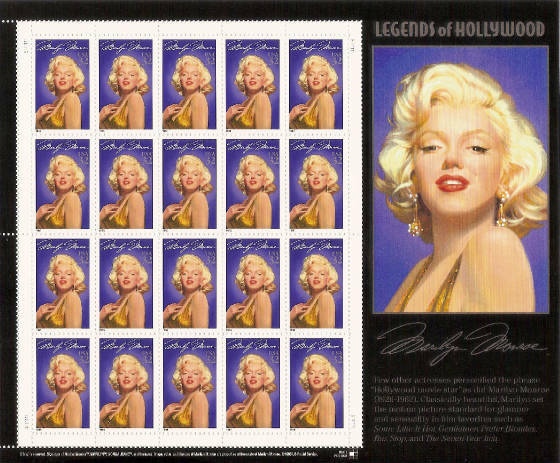 The United States Postal Service honored Marilyn with a 32-cent commemorative stamp on June 1, 1995, at Universal Studios Hollywood, in Universal City, California. 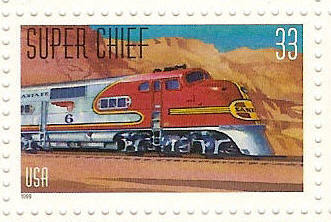 Scott #2967, designed by artist Michael Deas of New Orleans, Louisiana. Norma never knew who her father was. She was raised in foster homes. She was a high school dropout. Her mother died in a mental instituion. 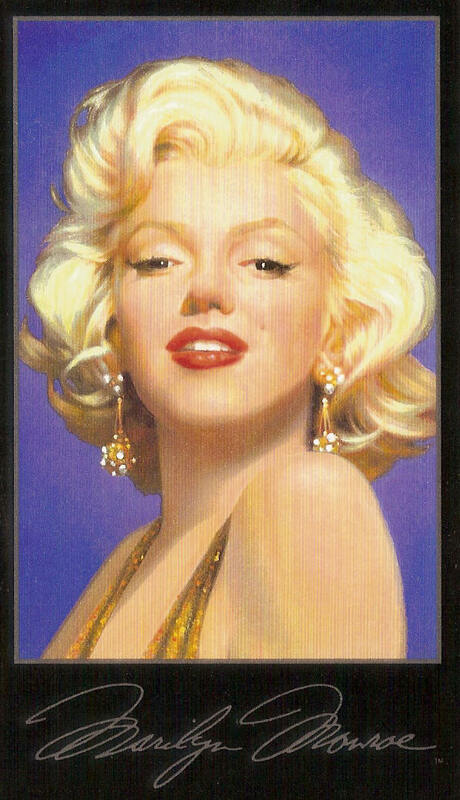 Norma died from a drug overdose at the age of 36 on August 5, 1962. Rotary International is an organization for business and professional leaders. Rotary provides humanitarian services and builds goodwill and peace throughout the world. 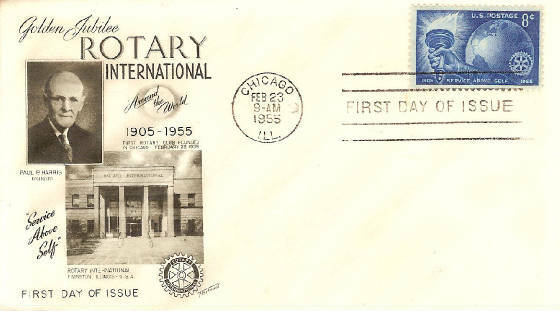 An 8-cent stamp commemorating the 50th anniversary of Rotary International was issued in Chicago, Illinois, on February 23, 1955, Scott#1066. 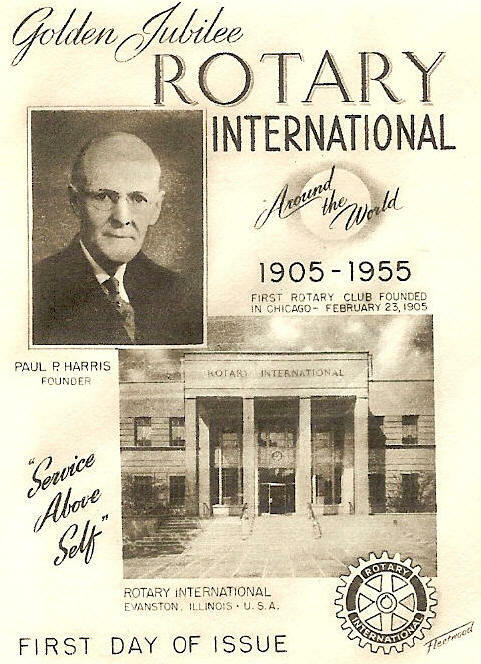 The first Rotary club was organized in 1905 by attorney Paul P. Harris in Chicago. I'm proud to have this first day cover in my colleftion. 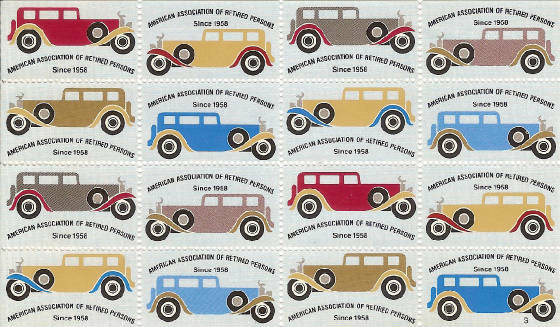 The Trans-Mississippi Philatelic Society dates back to 1934 when a group of philatelists from Omaha, Nebraska and Council Bluffs, Iowa, seeing a need for a greater fellowship among the regions stamp collectors, made plans for an exhibition in Omaha. Omaha had been host to the Trans-Mississippi Exhibition in 1898 and was only natural tp the founders that "Trans-Mississippi Philatelic Society" would become the name of the organization, it's purpose to provide a convention and exhibition annually in the mid-west. 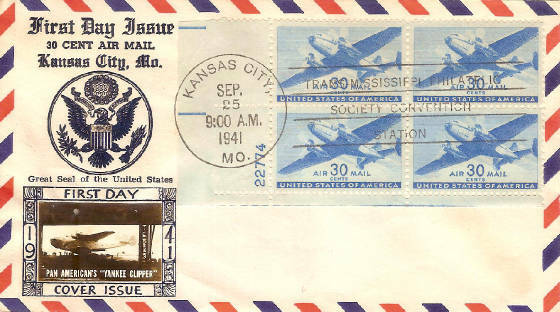 Kansas City, Missouri was the site of the annual Trans Mississippi Philatelic Society convention on September 25, 1941, and it appears that this great first day cover, with a plate numbered block of four Scott #C30's, was cancelled with a first day show cancellation consisting of the society's bar line cancellation in addition to the postal service circular date stamp at the KC cancellation station on September 25, 1941 at 9AM in the morning. The intaglio embossed cachet of Great Seal of the United States. 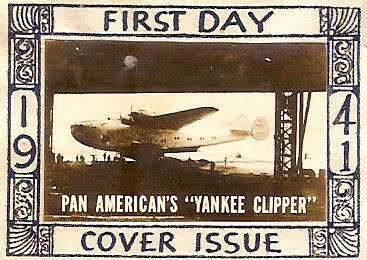 And the now-scarce, beautiful micro-sized black and white photograph of Pan American Airline's "Yankee Clipper, part of the cachet. The Yankee Clipper, the Boeing 314, was produced between 1938 and 1941. 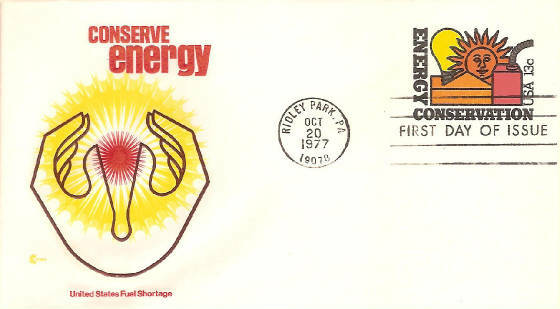 The 13-cent Energy Conservation / Development special issue stamps, Scott #1723 and #1724, were first available on October 20, 1977, in Washington, D.C. 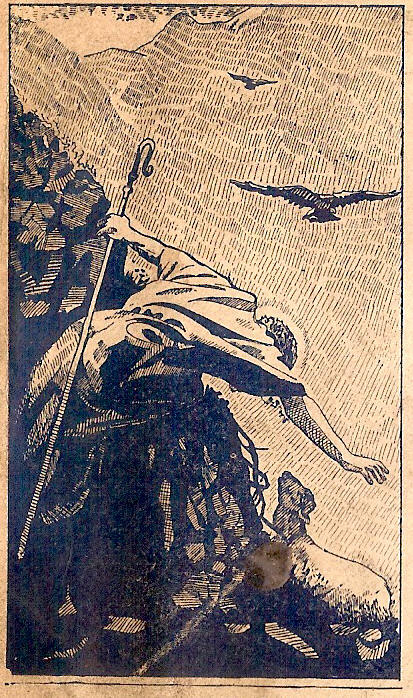 This fine first day if issue cover was issued on the same day in Ridley Park, Pennsylvania. Energy Conservation (Scott 1723) and Energy Development (Scott 1724). 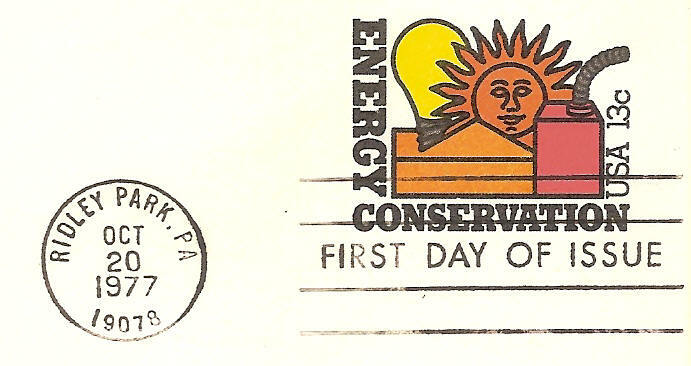 The stamp depicts a house, a gasoline container, and a light bulb. Only one is shown here. Scott #1723, Energy Conservation. 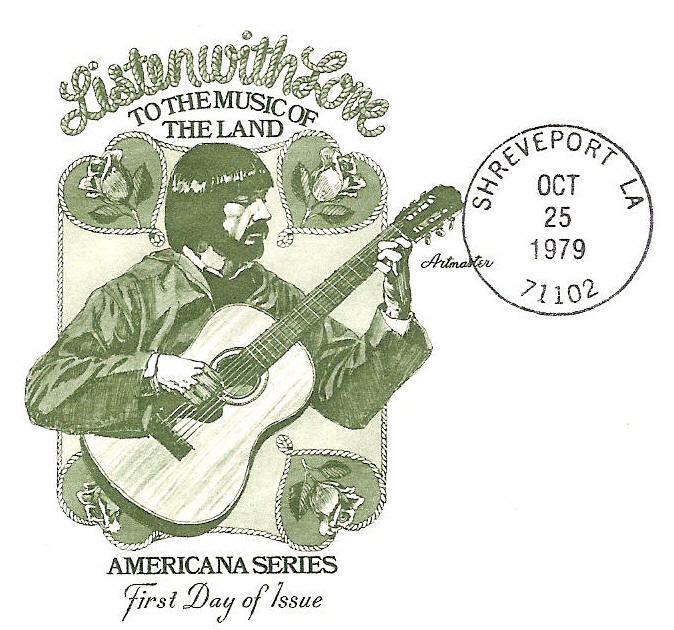 The stamp was designed by Terrance McCaffrey. 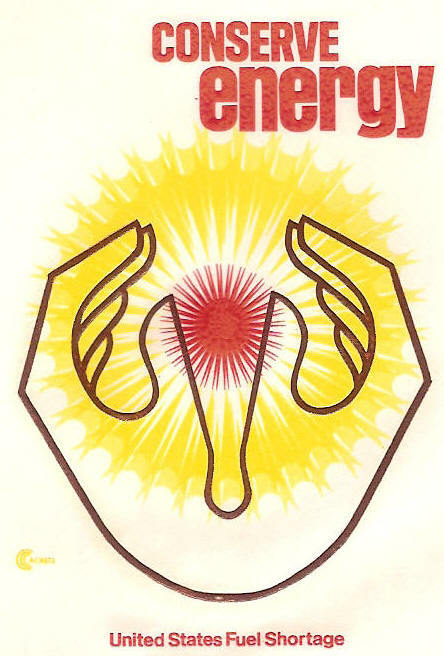 Conserving energy saves our natural resource and protects our planet. 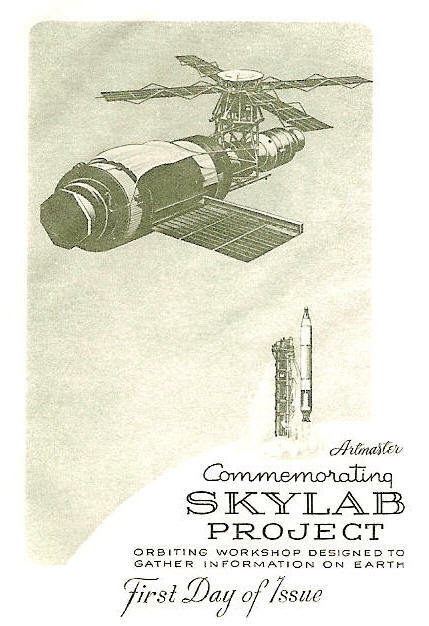 Skylab was the United States' first space station, orbiting our planet from 1973 to 1979 when it fell back to Earth. 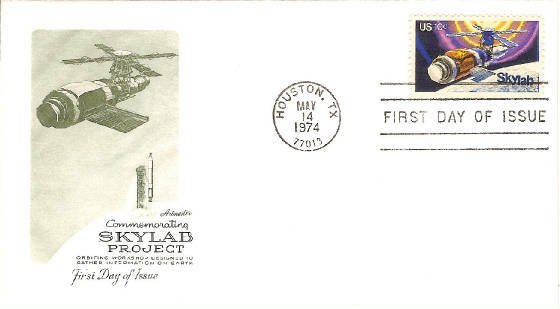 On May 14, 1974 the United States Postal Service issued the Skylab stamp, Scott #1529. 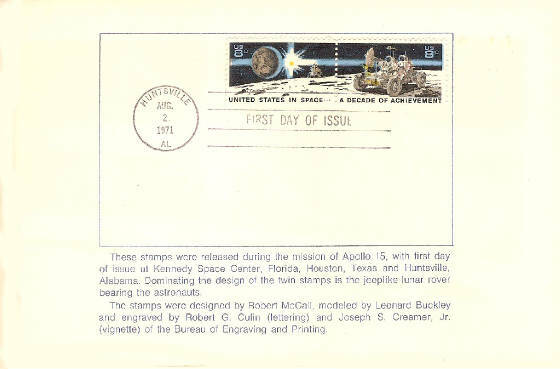 The Skylab stamp, and the First Day of Issue cancellation, commemorates the first anniversary of the launching of Skylab on May 14, 1973. Skylab orbited our planet for 2,249 days at an altitude of almost 270 miles, low earth orbit. Skylab was launched by the same rocket that carried our astronauts to the Moon, the Saturn V.
On July 11, 1979 Skylab reentered Earth's atmosphere and disintergrated 10 miles above Perth, Australia. Skylab was a magnificent achievement for space exploration, for the history of our nation and for the world. 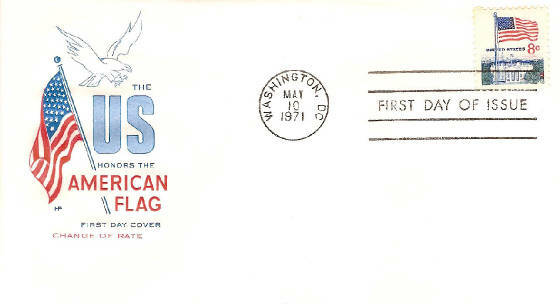 The Post Office Department issued this 8-cent American Flag stamp through the Washington, DC, post office on May 10, 1971. 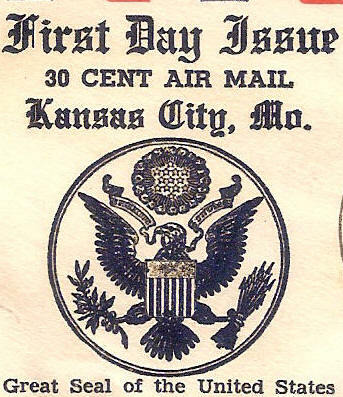 This 8-cent was a regular stamp replacing the 6-cent Franklin D. Roosevelt stamp of the Prominent Americans Series with the increased postal rate. Notice the "HF", a House of Farnum first day cachet. A fine mid-twentieth century patriotic first day cover. The United Nations General Assembly designated the year 1968 as the International Year of Human Rights. 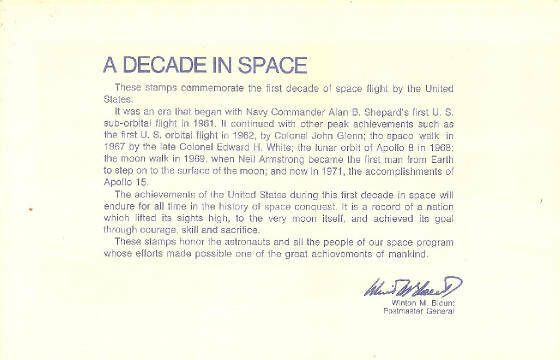 On December 3, 1968 this air letter sheet was issued in a first day of issue ceremony. 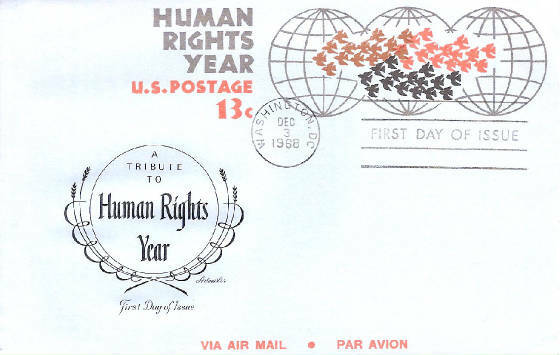 Forty five doves flying east to west over three globes of the Earth with the first day of issue bar line cancellation and circular date stamp to the left of December 3, 1968 in Washington, D.C. The United Nations Educationa, Scientific and Cultural Organization, UNESCO, published a special edition of the monthly UNESCO Courier in January of 1968. 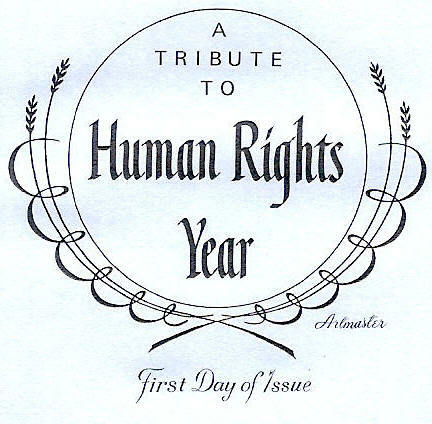 It is devoted to the Year of Human Rights and may be downloaded free by clicking any image in this post. Human Rights should not be recognized for a year. Human Rights should be recognized for eternity. Easterseals (formerly known as Easter Seals, founded in 1919 as the National Society for Crippled Children) is an American 501(c)3 nonprofit providing disability services, with additional support areas serving veterans and military families, seniors, and caregivers. 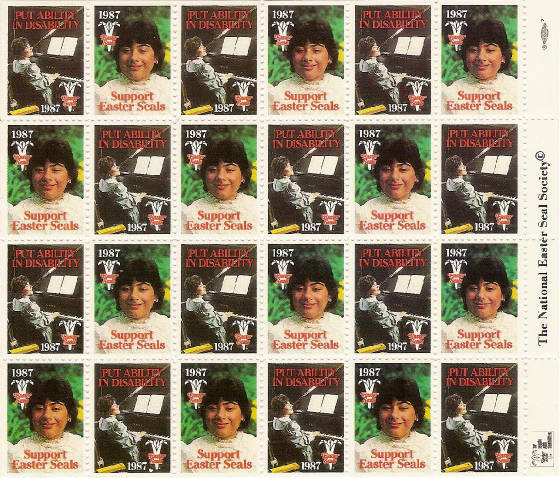 These stamps, also known as charity seals or stamps and not used for postage, represent the fundraising efforts of Easterseals and are placed on mail, usually on the lower part or reverse side of a piece of mail or package, to demonstrate ones support for this magnificent organization. 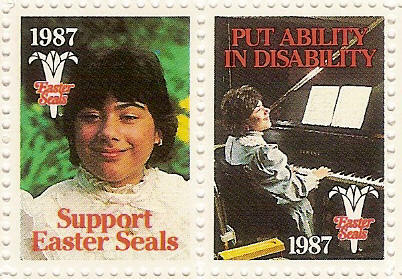 These stamps, issued in 1987, are part of my collection and portray a physically challenged young woman at the piano in addition to her portrait. Please support Easterseals.They are entrusted with the work of God. This philatelic wonder can be both a great source of joy to own as well as the the root of anger for any stamp collector. 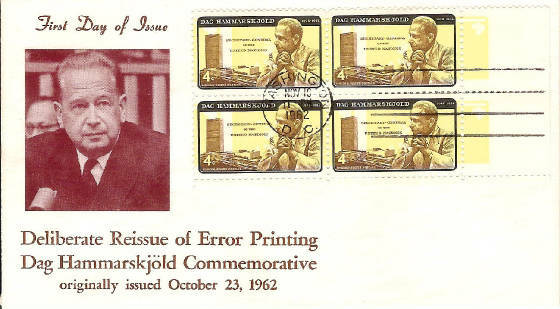 The yellow color was inverted on the Dag Hammarskjold memorial commemorative stamp, Scott #1204, issued Ocrober 23, 1962. 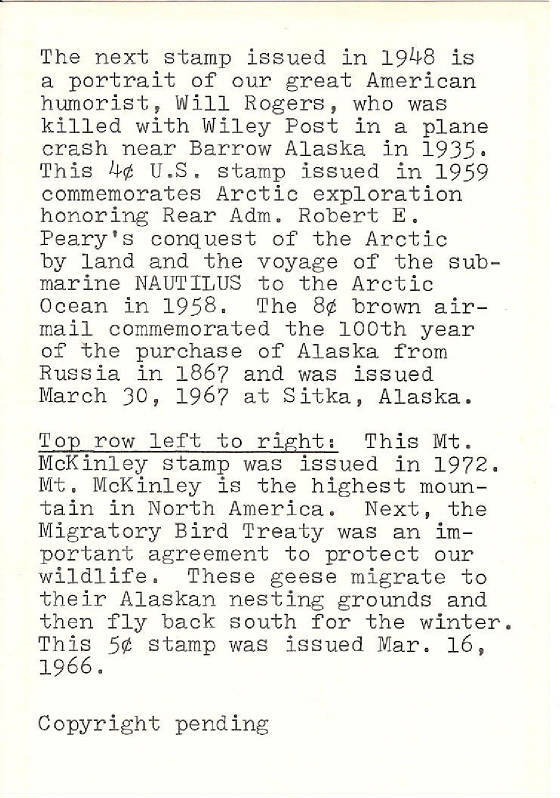 The stamp reprint was a deliberate error produced by the Post Office Department to avoid creating a rarity. 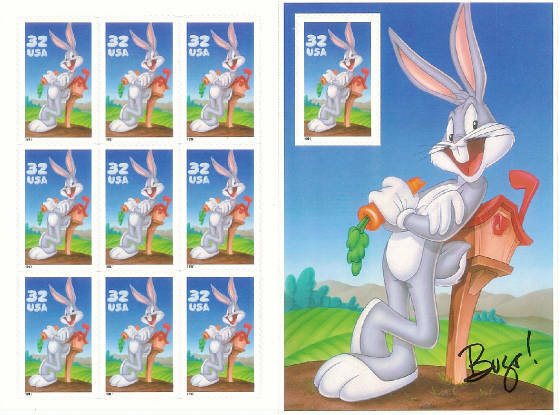 It was decided to reprint 40 million of the inverted stamps after the discovery of the error so there would be no rarity factor in the inverted stamp and to prevent people from profiting from the Postal Service's mistake. 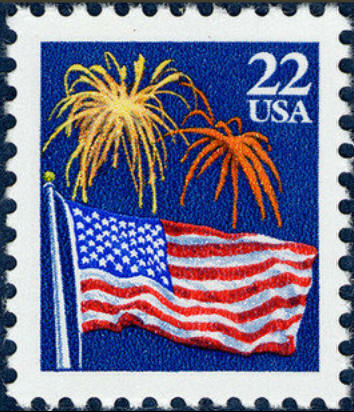 The stamp, showing the yellow background inverted relative to the image and text, is also known as "Day's Folly". 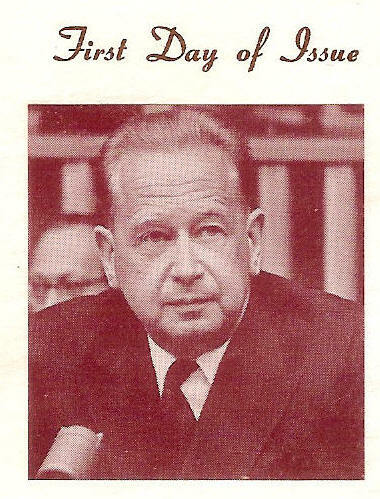 Postmaster General J. Edward Day ordered the intentional reprinting of the yellow invert after commenting, "The Post Office Department is not running a jackpot operation." The reprints were issued to the public on 16 November and described as a Special Printing. 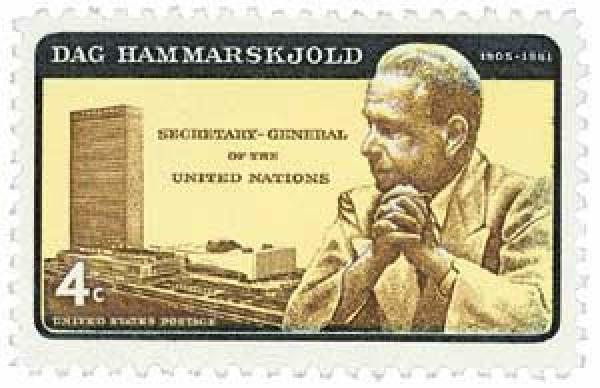 Dag Hjalmar Agne Carl Hammarskjöld (29 July 1905 – 18 September 1961) was a Swedish diplomat, economist, and author, who served as the second Secretary-General of the United Nations, from April 1953 until his death in a plane crash in September 1961. The man who discovered the invert, Leonard Sherman, was parodied in Mad Magazine the same year. New Jersey jeweler Leonard Sherman became very excited after he obtained a sheet of the stamps from the post office and discovered that the yellow color on his sheet had been printed upside down. 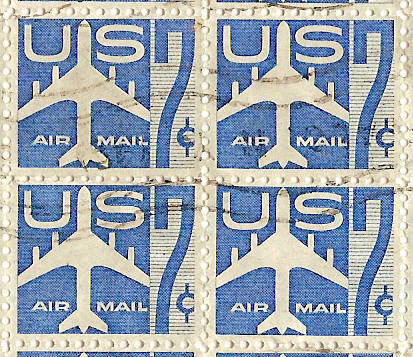 As a stamp collector, Mr. Sherman realized and knew very well that this type of inverted printing error in other issues of stamps had made those items extremely value and worth incredible amounts of money. Unfortunately, Mr. Sherman shouldn't have said anything about it and revealed his discovery too early. Postmaster J. Edward Day, upon hearing about Sherman's find, stated, "The Post Office Department is not running a jackpot operation." 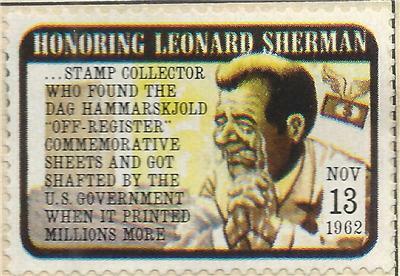 Day immediately ordered the printing of an additional 40 million stamps, all with the yellow color upside down, in order to destroy the rarity of Mr. Sherman's stamps as well as his good fortune. 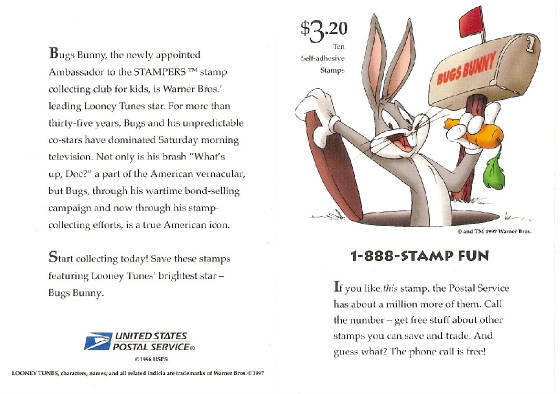 Mad Magazine found out and issued the parody stamp above. 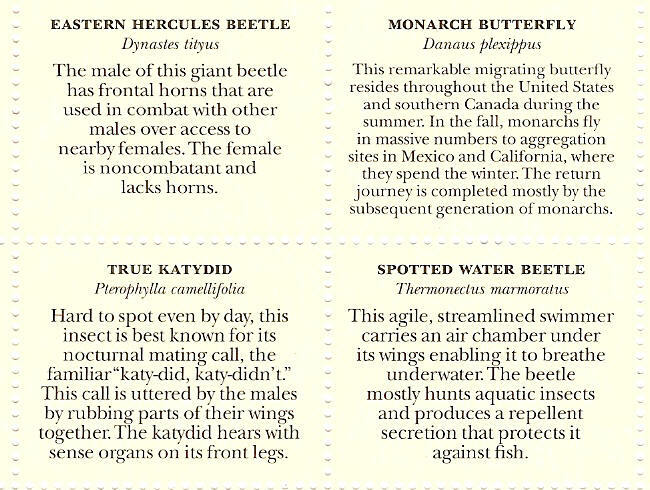 Click the stamps for more. Music is the soul of America. It's the spice of our nation. 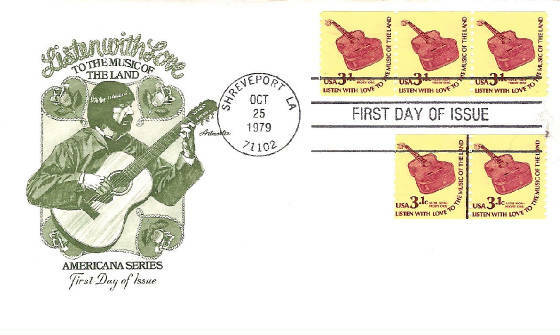 On October 25, 1979, in Shrevepoet, Louisiana, a coil stamp was issued proclaiming our nations love for music. 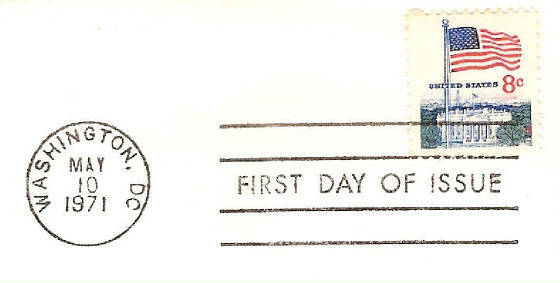 The first day cover was first placed on sale in Baltimore, Maryland the same day. 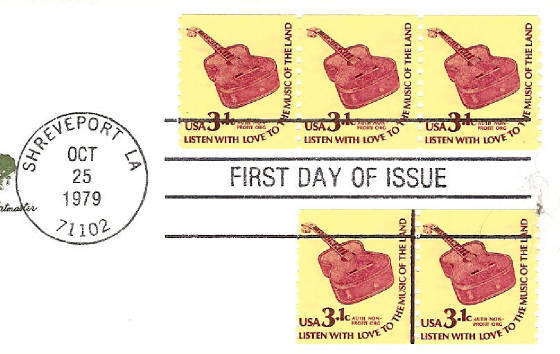 Five Scott #1613's 3.1 cent non-profits make up the first class rate along with the first day of issue postmark and Shreveport circular date cancel. The musician in the cachet looks very much like my friend and brother, Robert "Boogie" Cockrell. Robert is battling very serious illness. He is improving, with thanks unto God, with your prayers and love. Daniel Crevensten was a long-time employee and supporter of the Geophysical Institute at the University of Alaska in Fairbanks. After retiring as a lieutenant colonel from the U.S. Army in 1963, Crevensten became the executive officer at the Geophysical Institute, a post he held until September of 1975. 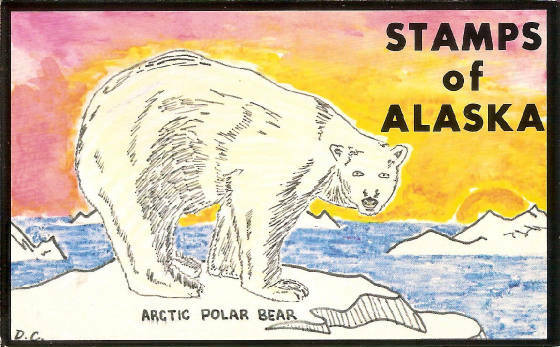 Dan was a stamp collector and he created a 6"X3.75" booklet expressing his love for Alaska in stamps. 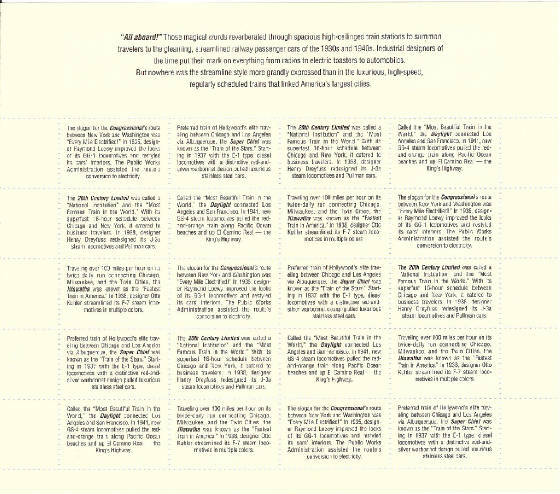 I'm proud to have Dan's little booklet in my collection and share it with you. 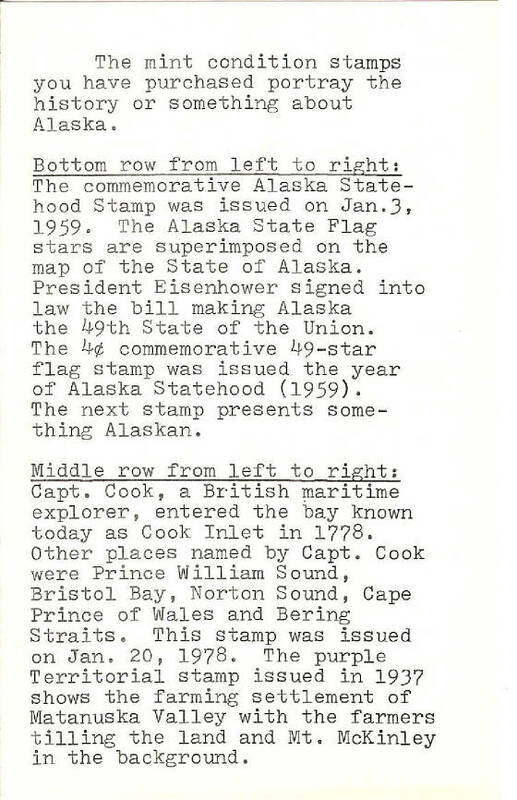 Dan's booklet also included a single insert printed on both sides describing the mint stamps and their connection to the history of Alaska. Alaska is one of the most spectacular places on Earth. Daniel Crevensten died peacefully on Feb. 18, 2008 in Bellevue, WA at the age of 90. 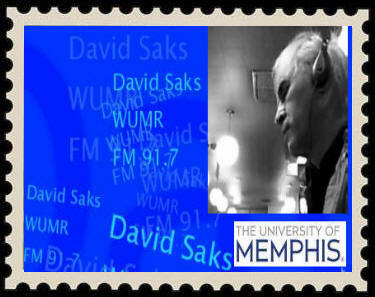 Thank you Dan, from one stamp collector to another. Charles Rachetes was a private from West Virginia fighting in the first world war. On September 9, 1918, two months before the end of World War One, Charles sent a postcard from Paris, France by way of A.P.O. (Army Post Office) 727 (also located in France) to his object of affection, Miss Butters, back home in West Virginia. 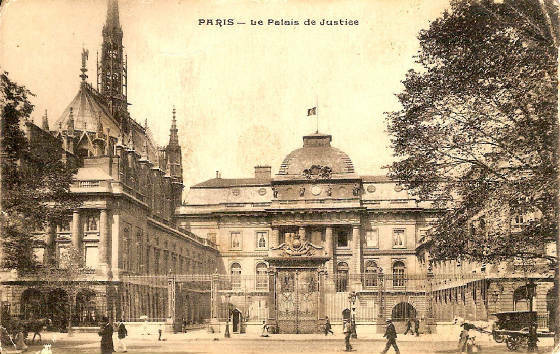 The Palais de Justice located in the Île de la Cité in central Paris, France, is built on the site of the former royal palace of Saint Louis, of which the Sainte Chapelle remains (built c. 1240, during the reign of Louis IX). The justice of the state has been dispensed at this site since medieval times. 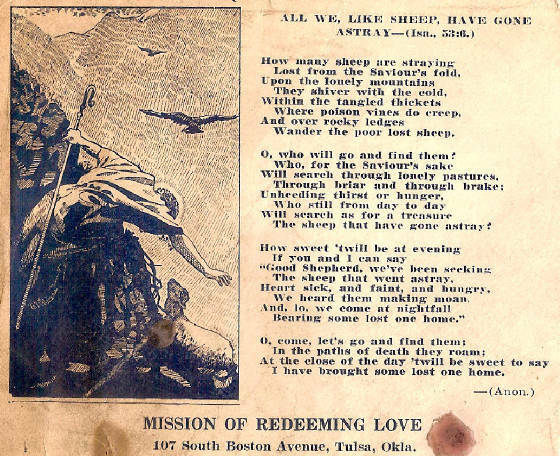 The inscripted, postmarked side of this beautiful postcard is a treat to see ! Charles' note to his sweetheart with the A.P.O. 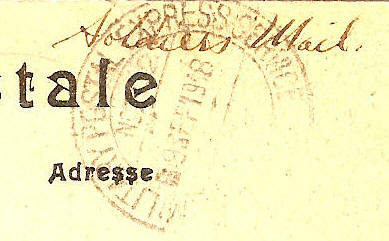 censor's postmark and signature. "Wish you were along so we could take in the sights together. Chas." Looks like it was stamped and passed by censor Lt. H.D.Allen. The war ended November 11, 1918. 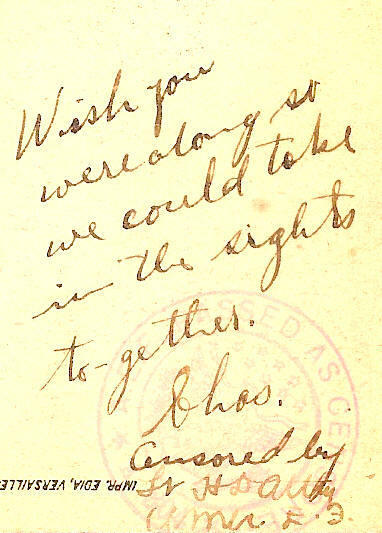 Charles sent the card on Septemebr 9, 1918, in the postmark. Hope he made it home ok to see his sweetheart once again. If your name was in this book you had class ! 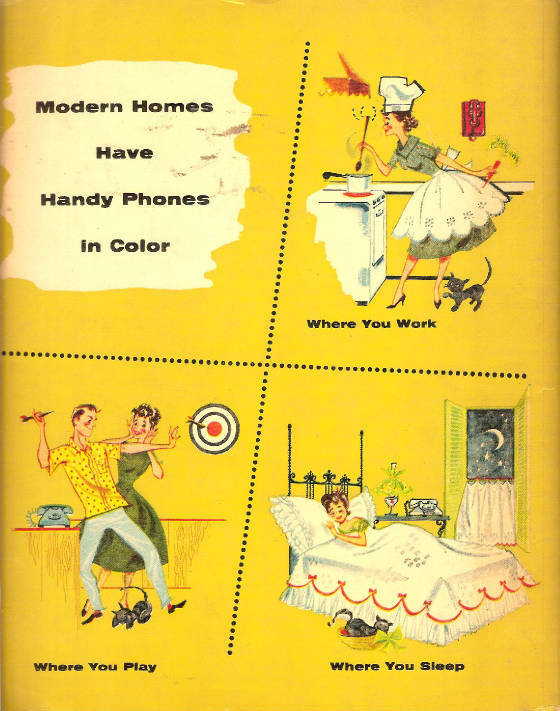 It's the 1960 Memphis Telephone Directory published by the Bell System. About 888 pages of Memphis' finest citizens and businesses. I love the color photo of my city's skyline, the guitar (looks like a Gibson T-120), trumpet and sheet music resting against the party-streamed cotton bale on the west side of the Mississippi River bank, the stage for the annual Cotton Carnival. 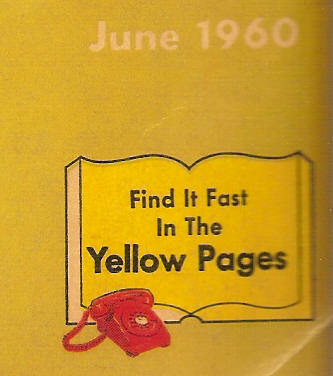 I've had this phone book a long time. It's time to share it with you. 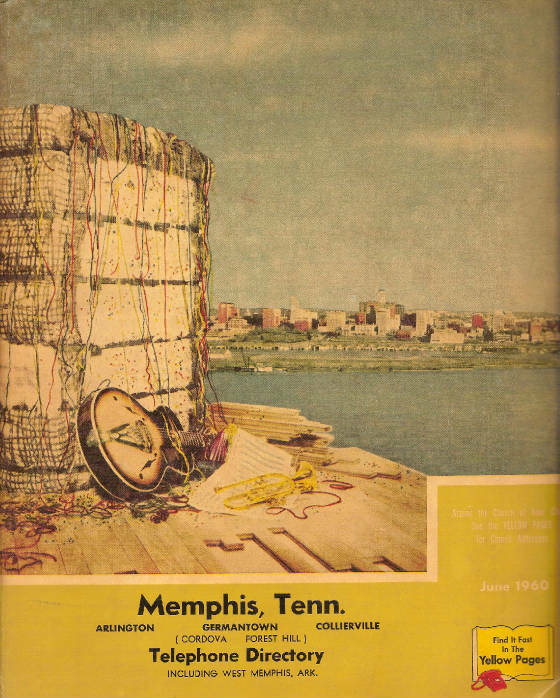 Memphis was the most beautiful city in the nation in June of 1960. Elvis wanted it that way. Hard to believe we put a man on the moon 48 years ago this month, July 20th, 1969. 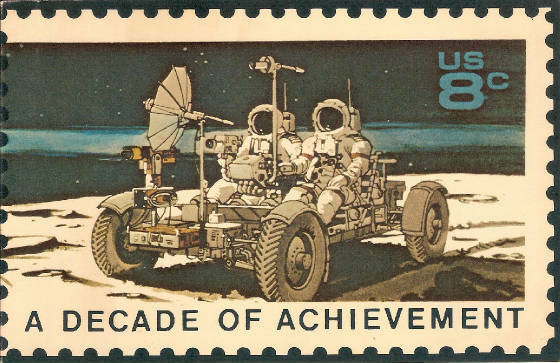 The "Space Achievement Decade" stamps were issued two years later on August 2, 1971. 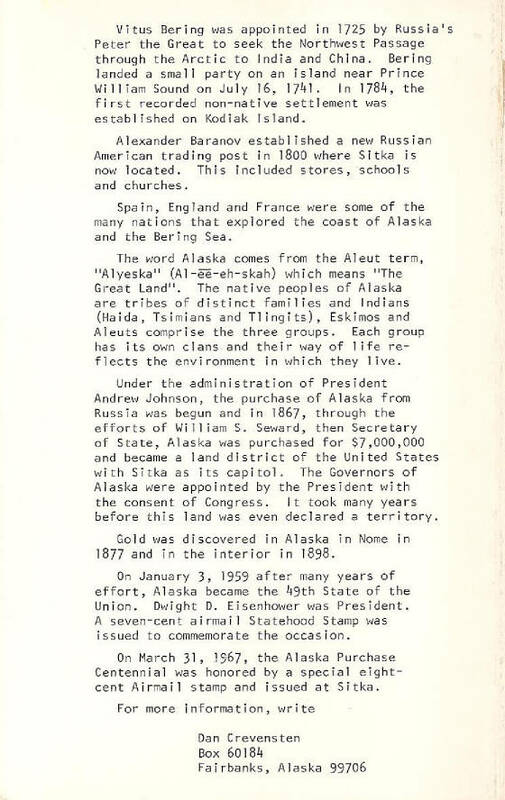 The First Day of Issue ceremony brochure consisted of a large booklet with enlarged illustrations of the two stamps on the front and back covers. The front with the lunar rover. 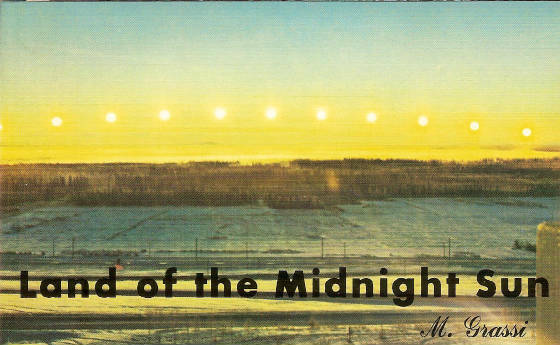 The back cover of the Earth, the Sun and the landing craft on the moon. 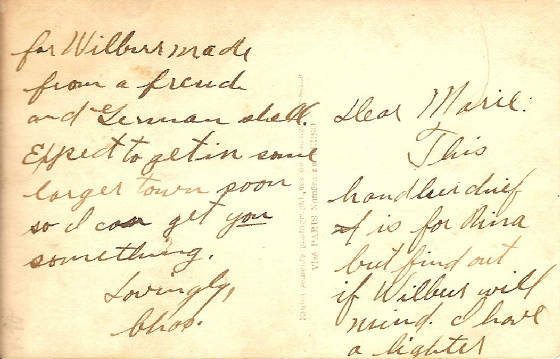 Inside front cover message from Postmaster General William M. Blount. 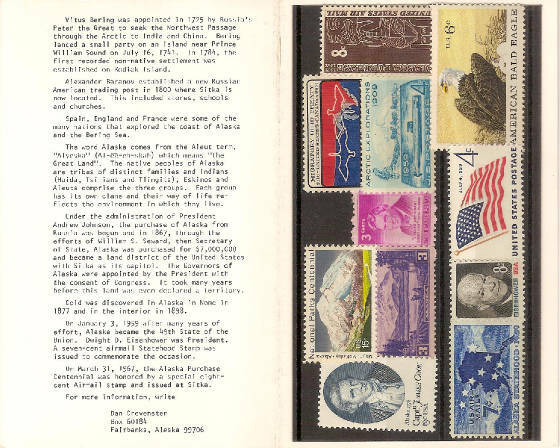 The ceremonial First Day of Issue stamps featuring Scott #'s 1434 and 1435 se-tenant with history and details details on the inside back cover. Se-tenant stamps or labels are printed from the same plate and sheet and adjoin one another, unsevered in a strip or block. They differ from each other by design, color, denomination or overprint.They may have a continuous design. The word "se-tenant" translates from French as meaning "joined together" or "holding together". 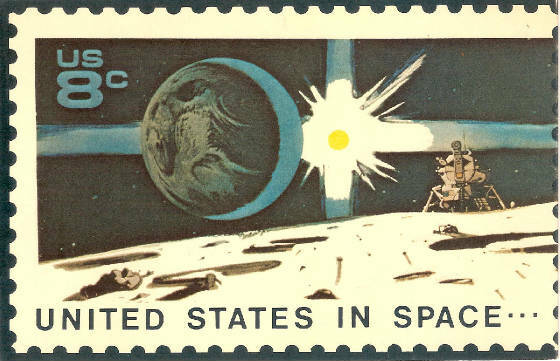 This ceremonial first day cover is much sought-after by the world's collectors of space on stamps. 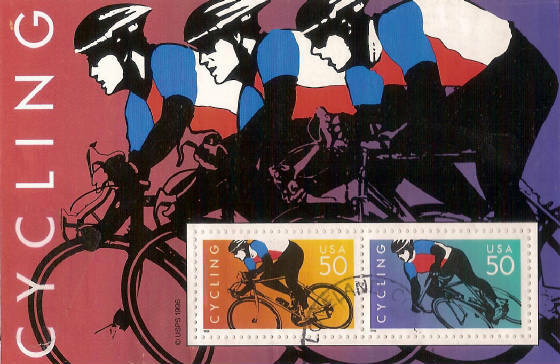 The Postal Service commemorated cycling with two 50-cent international postcard-rate stamps on November 1, 1996, in New York, New York. 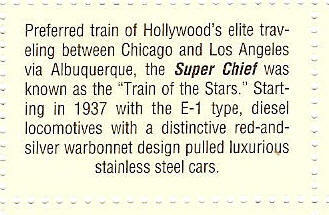 Scott #'s 3119a and 3119b adorn souvenir sheet #3119. 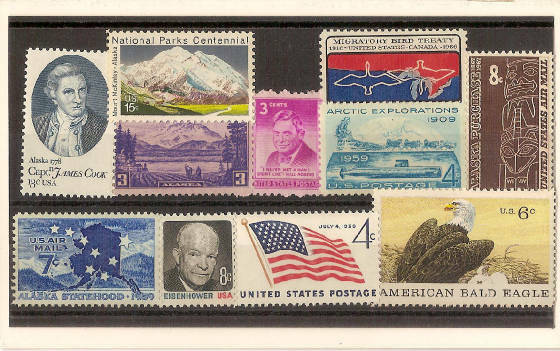 Cancelled in Loveland, Colorado, the souvenir sheet and stamps are worth about 3 dollars today. Collecting bicycles on stamps is a great topical challenge for stamp collectors and can be very rewarding. 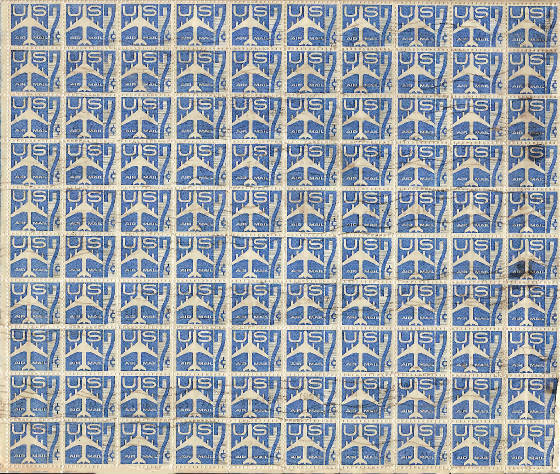 Issued July 31, 1958, this full sheet of 100 Scott #'s C51, the blue seven cent silhouette of a jet airliner, was covered with wavy bar line cancels. Most likely for first day of issue reasons. 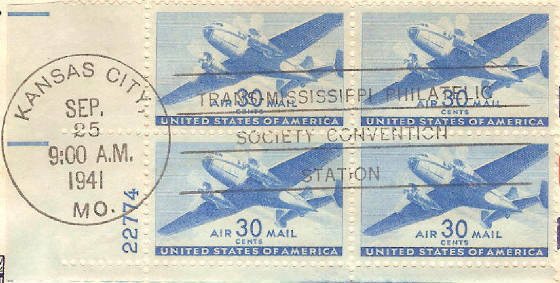 If I were asked to identify the jet on this fine airmail stamp I would say it's a DC8. The Douglas DC-8 (also known as the McDonnell Douglas DC-8) is a four-engine long-range narrow-body jet airliner built from 1958 to 1972 by the Douglas Aircraft Company. It was fantastic and incredible ! A few are still flying this very day and age. The years have faded the cancels on this nice sheet. On August 12, 1960 Scott #C60 was issued. It's the red rotary press-variety of Scott design number AP33, type of 1958. Full sheets can be a good investment. This sheet doesn't have great value, worth about 20 bucks, but still a nice return for any collector for the 7 dollar investment in 1958. Marshal Ferdinand Jean Marie Foch (2 October 1851 – 20 March 1929) was a French general and Marshal of France, Great Britain and Poland, a military theorist and the Supreme Allied Commander during the First World War. Foch was later acclaimed as "the most original military thinker of his generation". 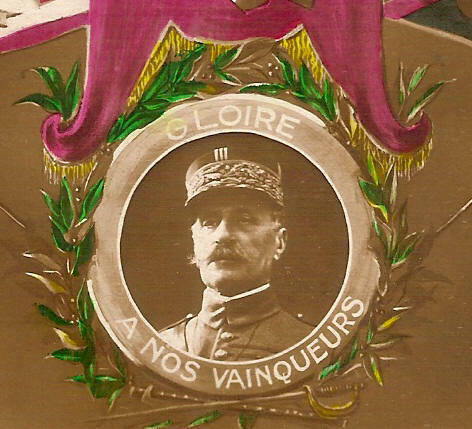 This beautiful card from the First World War displays a portrait of Commander Foch surrounded by his allies. This handkerdhief is for Nina but find out if Wilbur will mind. I have a lighter for Wilbur made from a friend and German shell. Expect to get in some larger town soon so I can get you something. The card must have been enclosed with the gifts for his friends. How did it escape the censor ? 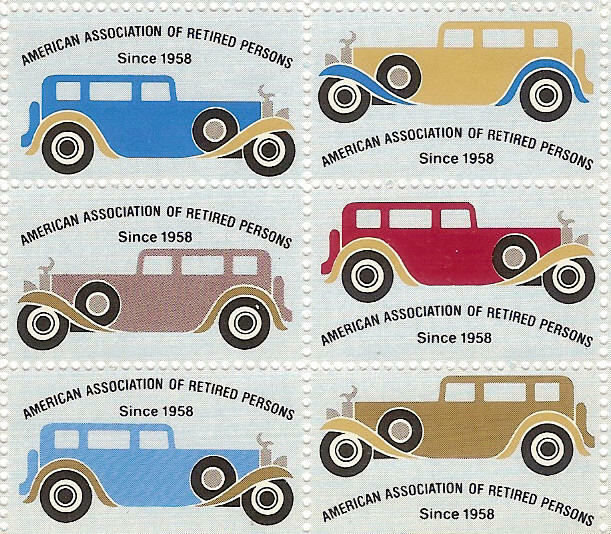 The American Association of Retired Persons is a fine organization. Dr. Ethel Percy Andrus founded AARP in 1958. AARP evolved from the National Retired Teachers Association (NRTA), which Andrus had established in 1947 to promote her philosophy of productive aging, and in response to the need of health insurance for retired teachers. A person has to be at least 50 years old to join the American Association of Retired Persons. This pane of cinderellas was printed some years ago. I don;t know exactly when, but my best guess is sometime in the 1980's. The Duesenberg-like automobiles in art-deco fashion hail the good life in ones twilight years, the years of retirement. If you're fifty years of age or older the good life is waiting. Click the pane above to link to the official AARP site at Http://AARP.Org. Click the block of six above to learn about cinderella stamps. Many a stamp collector has pulled his hair out attempting to identify the Washington - Franklin issues of 1909 through 1923. And sadly, it meant the end of the hobby for some because of the enormous frustration and time-consuming detail one must pour over to commit to the treacherous task. Scott #331, the one cent green, and Scott # 332, the two cent red. Cancellations on cover are semi-scarce for some years but plentiful because of the millions of stamps printed in these two varieties. Here are a few examples from my collection. Two cents was the first class rate in 1909. The rate had been in effect since July 1, 1885. These examples include the one cent green in pairs and the two cent red from 1909 to 1912. Notice the two scarce Tow & Catons R.P.O. 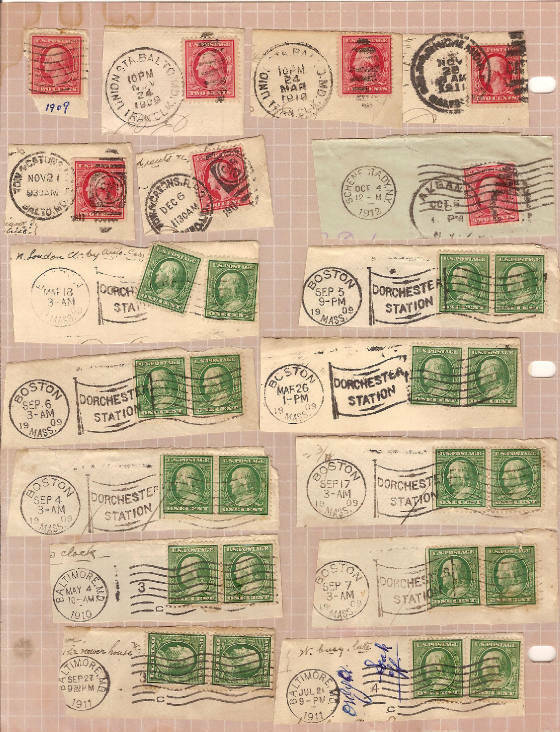 (railroad post office) cancellations on the upper left two cent reds. 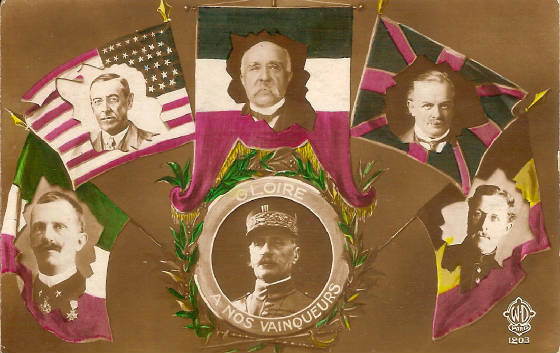 The 1909 Dorchester Station flag cancels from Boston, Massachusettes still look great ! The October 4, 1912 Schenectady and October 5, 1912 Albany, New York circular date cancels tied to the same piece were a nice find. The piece was sent to Albany and instead of stamping the Albany received circular date cancel on the back the postal clerk struck the bar lines with it on the front. This is a good way to collect Washington - Franklins. 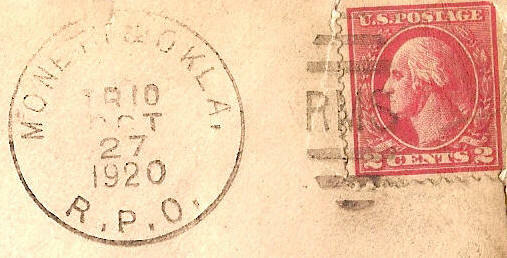 You'll find a gem studying cancellations on two fronts: the stamp and the postmark. 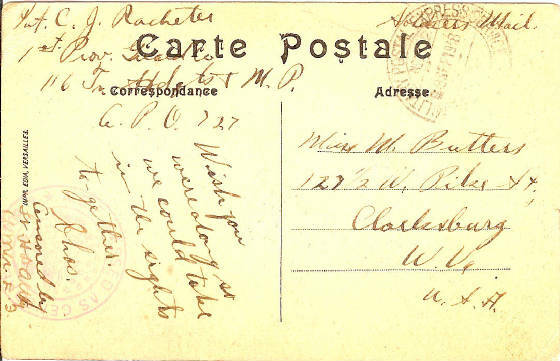 Click the Schenectady oiece for a great study on postmarks and cancellations from the Hamilton Township Philatelic Society, Mercer County, New Jersey. 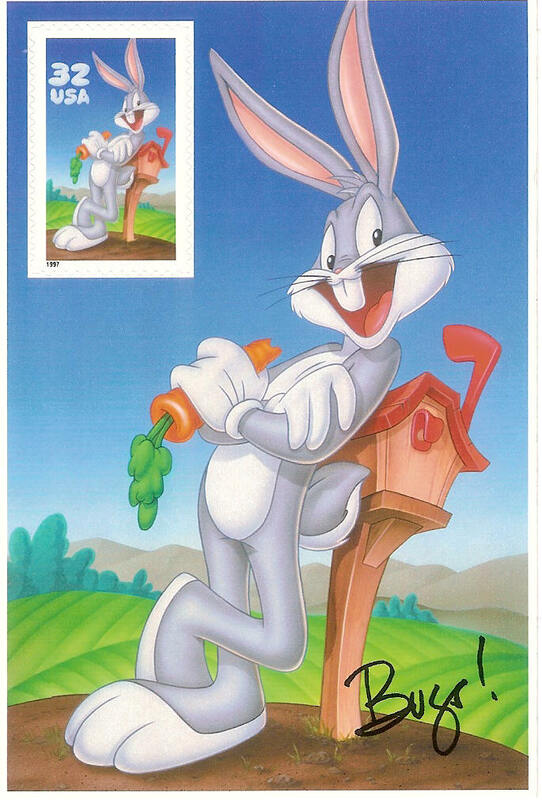 Bugs Bunny can be a good investment, especially if he's on the 1997 Scott #3138, die cut booklet pane extending the serpentine cut all the way through the booklet backing. It catalogs for around $160 bucks and usually sells for more. But for now, here's Scott #3137, Bugs in a popular pane of ten stamps with the serpentine cut in the stamp only, cataloging around $7 bucks. Add this booklet to your collection, Doc ! The 33-cent "All Aboard!" 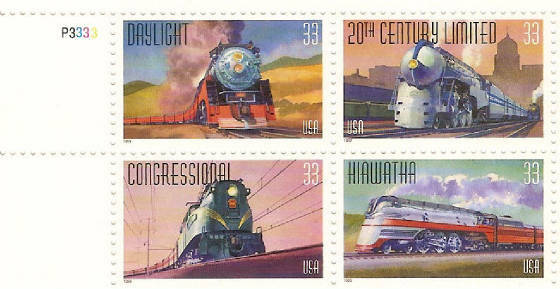 20th Century Trains commemorative stamps were issued in Cleveland, Ohio on August 26, 1999. 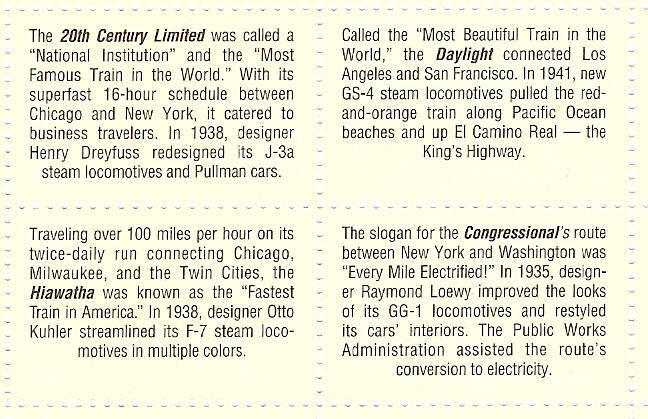 The five celebrated passenger trains are the Daylight, the Congressional, the 20th Century Limited, the Hiawatha, and the Super Chief. 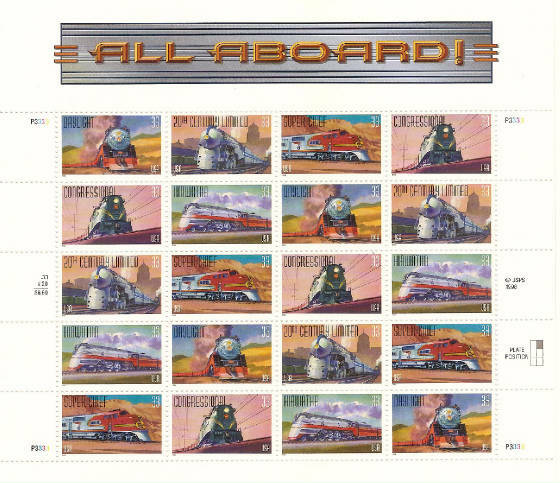 Train enthusiasts and stamp collectors throughout the world want this great issue. Scott #'s 3333-3337 catalog at $15 for the pane of 20 in the 2014 Scott Specialized Catalog of United States Stamps and Covers. It's a great buy at full catalog value, and more if contained in U.S.P.S. Stamp Fullfillment Services original packaging ! Here's my crossword "Mauritius" for Linn's Stamp News. Subscribe to Linn's. Click the crossword to link to Linn's. It's my honor to create Linn's crosswords. If you're a stamp collector, a subscription to Linn's is absolutely, positively the best decision you'll ever make to support your hobby. 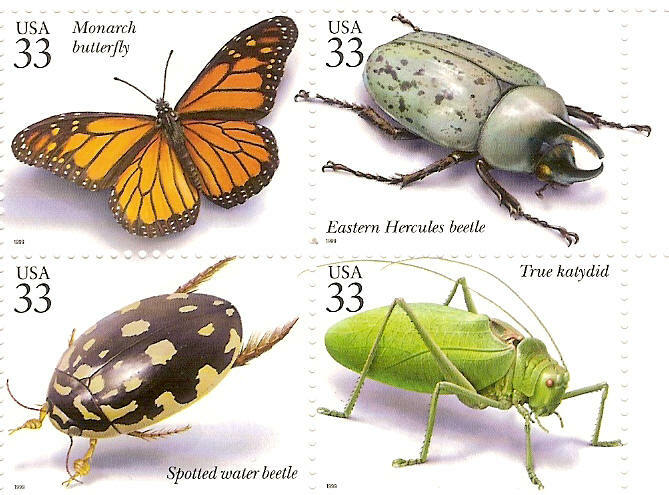 Linn's is the greatest magazine in the world for stamp collectors. I promise you, it is ! 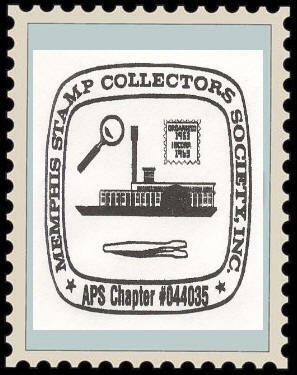 The Memphis Stamp Collectors Society meets tonight. Monett, Missouri was created to be a railrod town in 1870 and named for Henry Monett who was a popular general station agent for various railroads including the New York, Chicago and St.Louis railroads ("Nickel Plate Railroad") before becoming an agent for the New York Central Railroad shortly before his early death at the age of 35 in 1888. This nice, slightly scruffy old railroad post office cover was sent from the Monett & Oklahoma R.P.O. (railroad post office) on October 27, 1920. Two cent red Washington, Scott #528, is cancelled with the R.P.O. circular date postmark and shoeprint obliterator cancel with the initials "RMS". The letters "RMS" appearing in the killer shoeprint section of the duplex postmark usually indicate the canceller letters connected to a clerk responsible for its use or the postal station where the postmark was in use. In this particular case I believe the letters "RMS" serve as an abbreviation for "Railroad Mail Service". Monett is also known as "the strawberry capital of Missouri". Happy 4th of July to Everyone ! 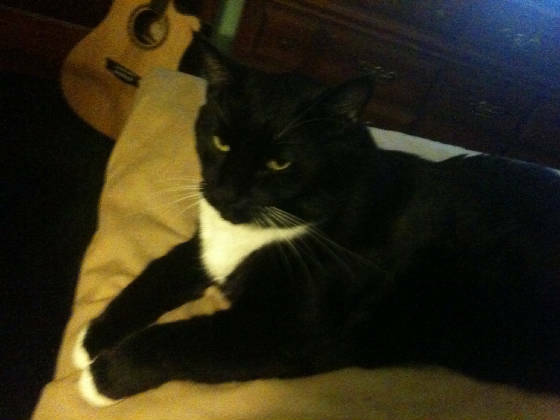 My pal, Mister Mewsic, on a quiet day. He's pushing 18 years of age now and still a baby. Have a great 4th of July holiday tomorrow. The David Saks Show ! 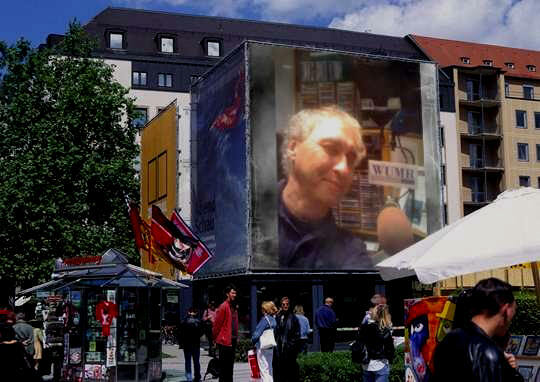 Click my pic to listen live ! 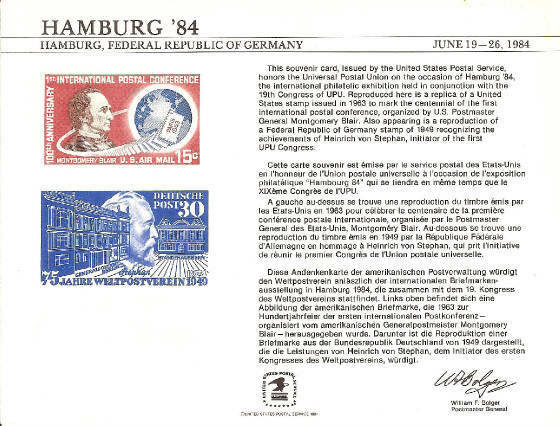 Hamburg, Germany, the Federal Republic of Germany, held a philatelic expo from June 19th through the 26th in 1984, a rather anticipated year because of the vaticination of George Orwell. 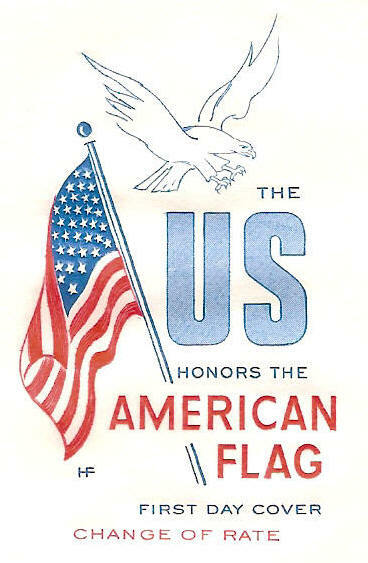 This souvenir card, part of my collection, was issued by the United States Postal Service in honor of the Universal Postal Union. 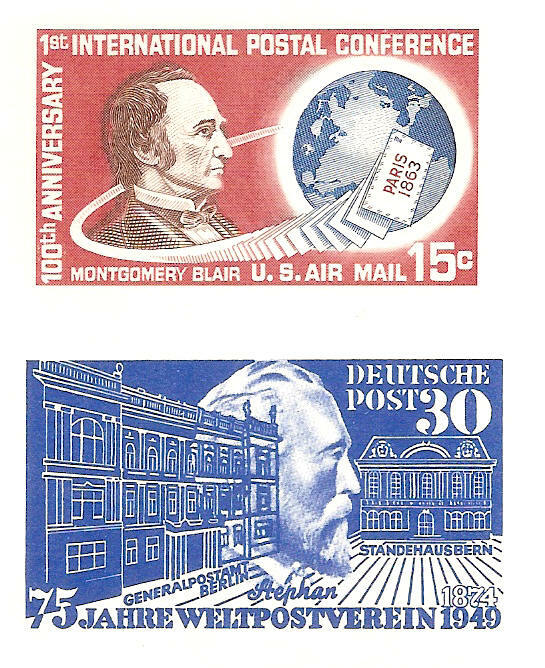 Issued May 3, 1963, Scott #C66, the United States airmail stamp at the top, honors Montgomery Blair,(1818-1883), the United States Postmaster General from 1861-1864 during the Civil War. Blair called the first International Postal Conference in Paris, France in 1863.The Conference was the forerunner of the Universal Postal Union. And below, issued October 9, 1949, Scott #669, Heinrich Von Stephan, the General Post Office and Guild House, Bern, honors the 75th anniversary of the Universal Postal Union. Von Stephan was the founder of the first Universal Postal Union Congress. This is a nice expo card to have, if you can find one. For the next few weeks I'll be talking about the first day covers of ArtCraft along with everything else. 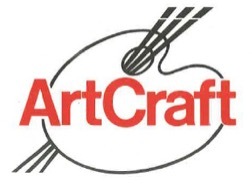 ArtCraft closed it's doors recently after 76 years of making philatelic history. I'm predicting a sudden, salubrious escalation in the value of the ArtCraft cachet, all ArtCraft first day covers and ArtCraft portrait cards. Leo's contributions to our hobby were significant enough to earn the coveted Luft Award and a place in the American Philatelic Society Hall of Fame. 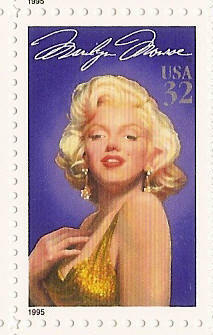 ArtCraft has well-earned it's place in the great chronological record in the history of philately. Their raised ink, line-engraved intaglio printed cachets rank among the most aesthetic in the world. ArtCraft cachets are not just beautiful. They are works of art that showcase the wonders of the world and illuminate the powers of human creativity and ingenuity. 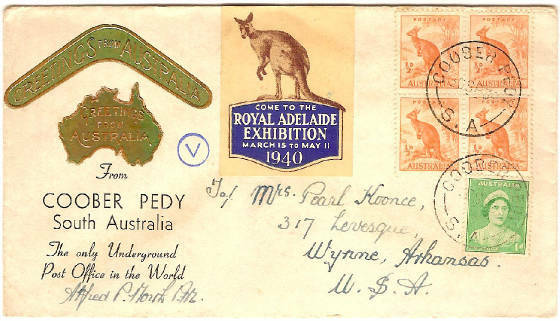 Could this become la pièce de résistance de toute la modern Australian philatélie ? Coober Pedy is a town in northern South Australia. The town is sometimes referred to as the "opal capital of the world" because of the quantity of precious opals that are mined there. Coober Pedy is renowned for its below-ground residences,called "dugouts", which are built in this fashion due to the scorching daytime heat. The name "Coober Pedy" comes from the local Aboriginal term kupa-piti, which means "white man's hole". Opal was found in Coober Pedy on 1 February 1915; since then the town has been supplying most of the world's gem-quality opal. Coober Pedy today relies as much on tourism as the opal mining industry to provide the community with employment and sustainability. Coober Pedy has over 70 opal fields and is the largest opal mining area in the world. Coober Pedy - no village, no buildings, no roads, just desert, mountains dotted with boulders. A bizarre lunar landscape, but for opal seekers is the most exciting place on earth, where again every day is the true challenge, happiness and luck just a shovel width apart and where life is defined by two words: winners and losers. 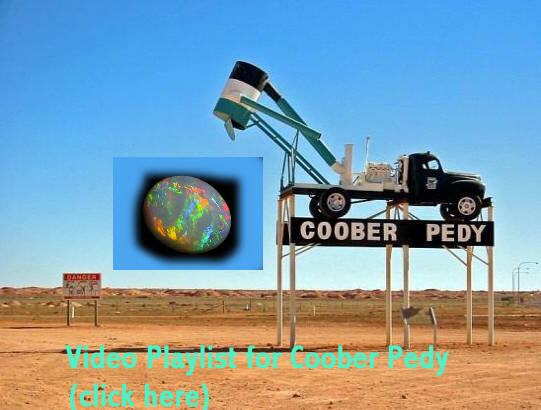 Coober Pedy, grab your hat, throw it into the air and where it lands start digging !